Welcome to the summer posting of London Grip New Poetry. Its rather un-summery cover picture relates to the poem Enduring Conquest by Martin Noutch. This is one of several longish narrative pieces in the issue; and it occurs to me now that mixing long and short poems can be much easier on-line than in a traditional print magazine with its constraints on page size and page count. While preparing this posting, I have heard of two well-respected print magazines encountering difficulties. In one case the problems are financial; in the other there is a need for fresh hands to cope with the editorial workload. Indeed, by comparison with the effort involved in producing London Grip, getting an issue of a print magazine assembled and produced and distributed strikes me as being quite as daunting as crossing the Antarctic! I hope the fact that London Grip comes free at the point of use does not tempt any of our readers to let their print magazine subscriptions lapse. Regard London Grip as a bonus – not as a substitute! details blurred by mutual disapproval. using a mutual friend’s shared email. as curiosity morphs into fascination. Recognition of aged faces eludes him. knows his own appearance would shock. bunches of children as generic as flowers. One photograph is of him, clean-shaven. or the unseen ghost aiming the camera. before outrunning the hounds of banality. like a freezing orphan locked out. the chief solace during his days of exile. unanswered whisperings in the night. neither for attention or to avoid recognition. stars that had not yet been. There was an unperceived narrowing to his habits. and wolf spiders still scuttled across the floor. he had become old without thinking about it. dribbles and plops on to my dancing men. The Cherokees are snaking live with blood. Redskins don't have plasters, I plead. his pipe for peace. It tastes not very nice. I sip my cherry coke and watch T.V. dance and die so bravely in black and white. Phil Wood works in a statistics office, which exercises his mind. Poetry is a choice of lifestyle outside the workplace. Little brass plates sunk in the pavement allow. Written in Berlin after reading ‘Stolpersteine’ – brass plates sunk in the pavement outside former residences of victims of the Holocaust marking their names and the date of their removal. Laurie Johnston has been writing poetry for his own mental health since he was a teenager. Along with his family and teaching in a South London school it has kept him sane in to his fiftieth year. 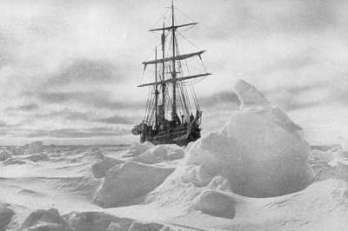 These three short pieces are extracted from a long poem about Shackleton’s boat voyage in the James Caird and the crossing of South Georgia, a feat of endurance and navigation that ended with the expedition’s rescue without the loss of a single man. By milliscotts – by asking lots of times ‘Could I? Survive – to rub you raw with repeated tries. And ecstasy gives way to suffering. To check that they were together. Myself, the two ahead, and then there’s him. Look and check – where am I in the line? Three – would admit they kept on counting four. Of two opposite and one beside them. Accompanied by one who knew the way. Martin Noutch is a primary school teacher living in Islington. He writes verse and fiction for pleasure and occasional drama for schools and churches..
it was really God who’d sent him. Thomas Ovans is Irish and came to London in the mid 1990s. He has a background in technical and academic writing and editing but he has recently begun to diversify into other forms of literature. After being a serious reader of poetry for many years he has now published poems of his own in Smiths Knoll and Message in a Bottle as well as in London Grip. in the whole vast bay. if they hadn’t bobbed away. Seth Crook taught philosophy at various universities before moving to the Hebrides. He does not like cod philosophy in poetry, but likes cod, philosophy and poetry. His poems have recently appeared in Other Poetry, Gutter, Ink, Sweat and Tears, Snakeskin, The Journal, Antiphon, Northwords Now, Message in a Bottle. to wall out sea, sand and piled up silt. out like refugees waiting for recognition. in vice-like fear, crouched in dumb resistance. the charred and shattered huts, the burnt out cars. Reflected in an oily puddle lies a star. Judith Wolton lives near the sea in Essex. Has a fascination with margins of land and water, estuaries, marshes etc. She is currently trying to put together a collection – but struggling with two strong themes. She has been placed in various competitions in Essex and Suffolk and is a stalwart supporter of poetryWivenhoe. wheat last year, feed corn the year before. the wood rotting, the weave loosening. electrical current, the law, or even love. what’s going on in the shade around them. primroses know it all – give away nothing. U.S. born Wendy Klein has published two full poetry collections with Cinnamon Press: Cuba in the Blood (2009), and Anything in Turquoise, out in February 2013. Her poems have appeared in many magazines and anthologies, and she will be sole adjudicator in the Havant Literary Festival Poetry Competition 2013.
this feral coppice tired and overspent. one hundred more, same tune, a sepia ghost. soldiers in coffins flown from far off lands. Peter Branson’s poetry has been published, or accepted for publication, by journals in Britain and overseas including Acumen, Agenda, Ambit, Anon,Envoi, The London Magazine, The Warwick Review, Iota, Frogmore Papers, The Interpreter’s House, Magma, Poetry Nottingham, South, The New Writer, Crannog, The Raintown Review, The Columbia Review, The Huston Poetry Review, Barnwood, The Able Muse and Other Poetry. His first collection, The Accidental Tourist, appeared in May 2008. A second collection was published in early 2012 by Caparison Press for The Recusant. More recently a pamphlet has been issued by ‘Silkworms Ink’. He has won prizes and been placed in many competitions, including a ‘highly commended’ in the ‘Petra Kenny International’, first prizes in the ‘Grace Dieu’ and the ‘Envoi International’ and a special commendation in the 2012 Wigtown. His latest book, Red Street, Selected poems, 2000-2012, from Lapwing Press, is due in 2013. He was not one to complain about the pain in his knee. was the walnut stick he’d lean on as he held forth. whose leather was scored by the rub of his heels. for a man enthroned in planed elm. in her deck chair in the tropical sun. as she stood rolling pastry, boiling jam, sorting the eggs. with a green home-made cushion, well worn. It was brought here from our life abroad. Beside it was a notepad, at her centre of organisation. making arrangements for the village, the house, the garden. The chair was her breadth, it suited her short legs. She’d work here while her children were out at school. she’d be forever finishing things in the kitchen. Ann Vaughan-Williams has written many poems on the borderline between colonial and post-colonial. Her work has mainly been published in anthologies of Merton Poets and Whatley Writers in South-west London and she has read and published widely. Her first collection was Warming the Stones, and most recently poems were published in London Rivers by Pakakariki Press, in Forty Voices of Richmond University, and in Haiku Quarterly. She runs a weekly writing group for people with mental health problems. She is an editor of the Long Poem Magazine. much difficulty her 40th birthday. uses it to cover her gray hair. I ask her where she's headed. D.M Aderibigbe is a 23-year old Nigerian undergraduate, studying History and Strategic Studies in the University of Lagos. His poetry and short fiction have been published in journals (including Cannon’s Mouth, The Delinquent, WordRiot, Red River Review, Ditch, Kritya, CommonLine, The Applicant, Thickjam, Cadaverine and DoveTales) and in anthologies, including the Kind-of-a-hurricane Press 2012 Best of Anthology – Storm Cycle. He has been greatly influenced by Natasha Trethewey, Ilya Kaminsky, Naomi Shihab Nye, Wole Soyinka, Octavio Paz and Helen Oyeyemi among others. but in the chain holding them together. but in the repetition of sticking them in the scrapbook. but in a widow’s being asked to clear his office desk. but in the wait for a response, any response. but in the slow adjustment to its aftermath. Emma Lee’s Yellow Torchlight and the Blues is available from Original Plus. She blogs at http://emmalee1.wordpress.com and reviews for The Journal and Sphinx. Their working winters have bitten at their happiness. Their hours and schedules harsh, both have been bullied. His phrase, ‘We need a break’. can be staked out easily along a full month’s reach. Elspeth, serving, smiles, makes much of them. and the broken jug of her relationship. Robert Nisbet, who lives in Pembrokeshire, has taught English and creative writing at a college of education, in two grammar schools, three comprehensives, for two universities and in a raft of adult education centres. He has published just over 100 short stories and nearly 100 poems. R.D. McManes is the author of seven poetry books and has had over 200 poems featured in 60 worldwide publications ,. He has been a featured speaker and conducted poetry workshops and copyright presentations for the Kansas Author’s Club. He currently resides near Scranton, Kansas. Jeff Bell: Bang Bang Bang! Crying, told me dog was theirs. from a tough part of Gateshead. asked children to create shade. "Your dog’s been knocked down!" "Your dog ran out and went under my car!" Still his eyes never left the TV. his horse must have been winning? to take their dog to a vet. I headed back to my car. and did their dad’s horse win after all? And what became of the £5 note? And I will take a view on that". with your fat, laughing Singapore chokes? For what we had in the old place. We can’t get it back. But nothing is ever enough. and I will take a view on that. this time only for me. Then return to stuffing bin liners. I won’t ever hear her coming through the front door again. Have gone with the Pru. Paul Richards, reached his half-century last year, and – apart from writing poetry (and playing the piano) – runs his own computer support business. Although very much a North London homeboy he now finds himself residing in South-West London and is loving it, particularly the green and posh bits. His first “proper” poem, written at the age of 9, was a rendition of the nativity in Tim Rice style pop lyrics.